What is the different between the normal fried rice and the Pattaya fried rice? Well, Pattaya Fired Rice or Nasi Goreng Pattaya in Malay, is made out of fried rice placed inside an omelet that is shaped like a pouch. Break open the omelet pouch and you will have the fried rice. This is a very common dish in Malaysia, and is usually available in Malay stalls and restaurants. 1)Heat up frying pan with a bit of oil. Add in shallots and garlic and stir fry until lightly brown and fragrant. 2) Add in chicken, carrot, pea, peppers and chillies and stir fry for 2 minutes. Make sure the vegetables is soft and the meat is cooked. 3) At this point add in the rice. Continue to stir fry until all ingredients are thoroughly mix. Add in ketchup, fish sauce, salt and pepper to taste to taste. 4) Fry for another 2 minutes and check seasoning. Dish out and set it a side. 5) In clean non-stick pan brush a bit of oil to it. Make the omelet and flip it over once the bottom side is lightly brown. 6) Put in a bowl of the fried rice at the center of the omelet and wrap up the 4 edges and flip it over a serving plate. Serve with some slice cucumber and tomato. Here are some pictures of the beautiful tomatoes from my garden. Blueberry again? Yeap, I've been loading up my pantry with blueberries since its so cheap now. Carlos never like eating it fresh but prefer it in his dessert so I made this slices with it. This cake is really light and moist. 2) Mix all the crumble topping together until it resemble coarse breadcrumbs. In a separate bowl sift flour, baking powder and salt. Set aside. 3) In a mixer cream butter and sugar, sour cream and vanilla until light and fluffy. 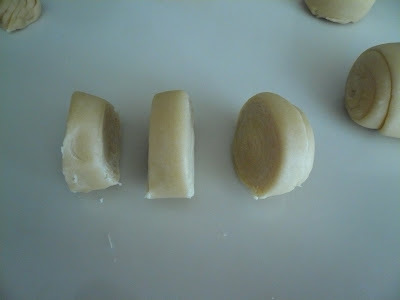 4) Add in eggs one at a time, beating well after each edition. Reduce the speed of the mixer and slowly add in the flour until well combined. 5) Spread the batter evenly into the baking pan, cover the top of the batter with blueberries (press berries slightly into the batter) and sprinkle the crumble topping over the blueberries. 6) Bake in a pre-heated 350 degree F over for 35-40 minutes or until golden brown. Cool completely in the pan. 7) To remove from the pan, just lift the cake up from the overhang parchment paper and cut into squares. There is satay but then there’s Kajang Satay. My hometown Kajang is a small town located in State of Selangor in Malaysia is well known for its Satay and people come from near and far just to have it. They are famous because of their succulent beef, mutton and chicken satay with their secret marinate and their homemade peanut sauce compliments the satay so well. We had BBQ a few weeks ago and Diana and I were craving for Kajang Satay so we decided make some. Our satay taste is no where near as good as Kajang Satay but it does stop our craving for the time being until we go back to Malaysia. 1. Cube the chicken meat, drain and set aside. Marinate it with all the above ingredients and set aside for at least an hour. 2. Thread about 4 pieces of meat on the skewer like a kebab. Brush the meat with some coconut milk before grilling. 3. Grill it over burning fire, turning over often until the chicken is cooked. 1. Heat up a tablespoon of oil in a heavy saucepan. Add in garlic and shallots and stir fry until fragrant. Add in sambal oelek and curry powder. Stir fry for a few second and add in the coconut milk. 2. Stir until everything blended well and add in the water, peanut butter, sugar and seasoning. 3. Continue to cook until sauce thicken and serve the sauce with satay. Here is one of my favorite simple recipes. It was a real treat for afternoon tea or a slice after dinner. 1. In a food processor add cream cheese, eggs, sugar and lemon juice. Turn on the machine and let it blend for a few second until mixture is smooth. Turn off the machine and add in the slice strawberry for the filling. 2. Mix well and pour into the pie shell. Bake at 350 degrees for 15 to 20 minutes. 3. Cool and refrigerate. Place slice strawberries completely over pie top or around the edges, depending on the amount of strawberries you’re using. 4. Heat up the strawberry jam in the microwave until soft and brush tops of berries until thoroughly glazed. I received this award from my fellow foodies My Household Capers and Cikmillah and I am greatful for their beautiful gesture! 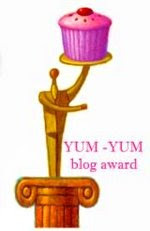 I am passing this award to the following bloggers whose blogs are full of yum-yums food. What you do with your leftover mashed or roasted potatoes? These potato croquettes are the answer. They make an equally tasty side dish for lunch or dinner. In fact, they are so yummy that you might want make some mashed potatoes just so you can have them. 1. Mix all the ingredients together in a mixing bowl. Form into small patties and set aside in the fridge for half an hour before frying. 2. Heat up a little bit of oil over medium heat and pan fried both side until golden brown. Note : You can add some tuna or smoke salmon to this dish. I made this caramel cake on the long weekend. It was so hot and humid and I just don't want to crank up the oven so decided to make steam cake instead. This cakes turn out to be really soft, not too sweet and a nice sweet smell of caramel. The only problem I had with the cakes is it 'senget' (slant) to one side while steaming. I am pretty sure is not the fire because I made sure the steamer is right at the centre of the fire. Can someone enlighten me what I did wrong? 1. Place the 150g of sugar in a small heavy-based saucepan and heat gently until sugar melts and caramelizes to golden brown colour. Take care to keep pan on very low heat to avoid burning the caramel and remove pan from heat once it reaches a golden brown colour. 3. Add the melted butter, milk and beaten egg to the cooled caramel syrup and stir well to combined. 4. Sift the flour and bicarbonate and salt into a mixing bowl. Make a well in the centre and pour in the liquid. Gradually incorporate the dry ingredients into the liquid, stirring gently with a wooden spoon or balloon whisk for a smooth batter. 5. Fill small lightly buttered cups three-quarters full of batter and steam for 15 to 20 minutes. Note : This recipe yield 7 very small cakes. If you want to make more just double up the recipe. I received this very special award from Ching of Little Corner of Mine Thank you Ching. I really apperciates it. This is the first time I am doing the brisket in the oven. I will usually cook it in a slow cooker but this time I am trying something new. A lot of people will smoke their brisket but I have no clue how to do that so the easiest way for me is to use the oven. Just remember not to trim too much of the fats away as the fats will keep the meat moist. Actually I trimmed off all the fats so the meat was a bit dry. For the seasoning you can used any seasoning as you like and adjust according to your taste. This is how I do the meat. 1) Wash, clean and trim some of the fats from the brisket. Pat dry. 2) Lay a large piece of aluminium foil on a baking sheet. Put the meat on top of the foil and rub it with salt, pepper, paprika and Worcestershire sauce. Sprinkle the onions and garlic on top of the meat. Seal up the foil and wrap it again with another piece of foil. 3) Let it marinate for an hour and then pre-heat the oven to 275 degree F and slow cook it for at least 4 hours. Check the tenderness and if its not tender enough you might need to bake for another half an hour. 4) Once the meat is done remove from oven, unwrap the foil and let the meat rest for 20 minutes before slicing. 5) Slice the meat against the grain and slather it with BBQ sauce before serving. Note : For the leftover meat you can make it into chopped BBQ sandwich. I will buy these frozen pancakes once a while from the Asian store but now everything seems to be getting a bit expensive. They are charging nearly $3.00 for a packet of 5 pieces. So I thought it would be fun to try to make some myself as it’s far cheaper than buying the frozen ones. 1. Mix the flour and salt together and then add the 1 tbsp of oil and the boiling water to the flour. Mix thoroughly to form a dough then knead for 5 minutes. 2. Form it into ball, cover and let rest in the mixing bowl for 20 minutes. 3. Form into a log and cut into 12 - 16 pieces then roll each piece into a round disk. 4. Brush with oil or sesame oil and sprinkle with scallions. Roll into a cylinder and then coil it into a snail shape. Cover and let rest for 20 minutes. 5. Flatten the dough with your hand and then roll it out again. 6. Heat up non-stick frying pan over medium heat and brush it with some oil. Pan fried both side until golden brown. 7. Cut into wedges and serve with any dipping sauce of your choice.